Yep, it’s that time of year again! It’s time to Enjoy A Short Transient Event Right-away! (Commonly abbreviated as “EASTER”) You may have participated in EASTER before. After all, the contest has been running annually since 2011 (though, the contest started in 2007). The rules have been extremely similar every year, but I am changing things up this time (read on for more information). But before we start with all the super interesting rules, I'd like to thank LASF for allowing me to host the contest this year. I would also like to thank Greg and Monica Tull for providing the Bound DVDs (and for creating the awesome film). You entry must be Easter related in some way. However, it does not have to religious (unless of course you want it to be). However, try to think outside of the box with your film. There are so many things to do with this theme; I want you to be as creative as possible. Copyrighted material (music, themes, etc) are allowed, but use of them may affect your score (though, probably not too terribly much). Originality is strongly recommended. Only one entry per person will be accepted. If you submit more than one entry, only the first entry will be considered. Entries must contain the EASTER 2015 image or the text “Made for EASTER 2015” somewhere in the film. The deadline for this contest is April 4th, 2015 at 11:59pm (midnight) EST. You can see the countdown timer and convert to your time zone here. This means you have a full two weeks to create you entry. Videos must be uploaded to the internet to submit. You can submit videos to YouTube, Vimeo, DailyMotion, Flickr, or other video sharing sites. To submit your entry, please send the link to you video to me either in a email (recommended!) or through a forum Private Message. Do not post links to your entries in this topic. Entries may be public or unlisted when submitted, but I recommend keeping your entry unlisted until the contest is complete to prevent people from stealing your idea. Originality is getting the most attention this year. I have noticed that in previous years, a lot of entries looked the same, and were not too original. This year, I want you to think outside of the box and come up with something nobody has done before! The first, second, and third place winners will receive prizes. Special thanks to Monitogo Studios for providing the DVDs. Let's all show them our appreciation. The way the prize pool works is simple. The first place winner chooses his/her prize, then the second place winner chooses their prize out of the remaining two, then the third place winner receives the final prize. If you have any questions, do not hesitate to PM me! I have created a signature image for all you who want to help advertize the contest! Harborlight has created a topic to let you share progress on your film (if you want). You can check it out here. Sweet momma. I am most definitely in. Man, I so want to do this, but don't know if I could come up with something original enough. We shall see! P.S. Shouldn't this be in the "Contests and Festivals" section? Since members cannot create topics in the "Contests and Festivals" section, I created it here and have to wait for a moderator to move it there. I have an idea for it already, but it is heavily based on that of a film. Thanks rioforce for hosting it this year! And for the prize selection! Hopefully I will be able to enter something. My spring break is the week before Easter this year, so I imagine I'll be able to enter. Time to start the idea cooker. I want to do this but I probably can't I'll just have to see. I was going to save the Good Friday holiday for getting my learner's permit, but looks like I could squeeze in a little time to animate then, as well as next weekend. I understand the obvious no four-letter words/crude/foul language, but what about slang and (wink wink) what might be considered religiously inappropriate? You know... like if someone wanted to take the lord's name in vain and stuff? I'd like to play by the rules but still manage to offend people. More importantly, thanks for hosting this year. It's nice to see this contest carried on. I'll probably enter if I can think up an idea. I'm in, for sure. I've somehow managed to never enter EASTER before, so this should be fun. That Bound DVD sure would be nice, too. Obviously, I cannot prevent you from using slang or taking the Lord's name in vain, however, if the slang closely resembles swear words in an attempt to bypass the "no swearing" rule, your film could be disqualified or it could severely hurt the judging of your video. My suggestion is that if you consider something to be offensive to somebody, don't include it in the entry. If you personally don't find it offensive, but know that a lot of other people find it offensive, just leave it out. Can the film be about the time before or the time after Easter? 5. The film may not contain any mature/explicit content. This includes, but is not limited to: swearing, excessive/gory violence, overt sexual content, and blatant drug references. However, slapstick comedy is allowed. Okay so, slapstick is allowed. Not that I'm actually going to do this, but just for argument's sake...what about slightly rude humor? Such as fart jokes for example. Yes, as long as the film has something (even vaguely) to do with Easter, that it qualifies. Slightly rude humor (like you example) are not against the rules. You may use it in your film. However, excessive use of it may hurt your score. I received a PM asking to clarify the rule about copyrighted material and themes. I have updated the topic post to be more clear on the subject. Copyrighted and licensed themes are allowed, and will probably not hurt your score, however, I am stressing originality this year. What if I promise that there will be no smell. Will that help my score any? This looks awesome! I'm in! The prizes have been updated. 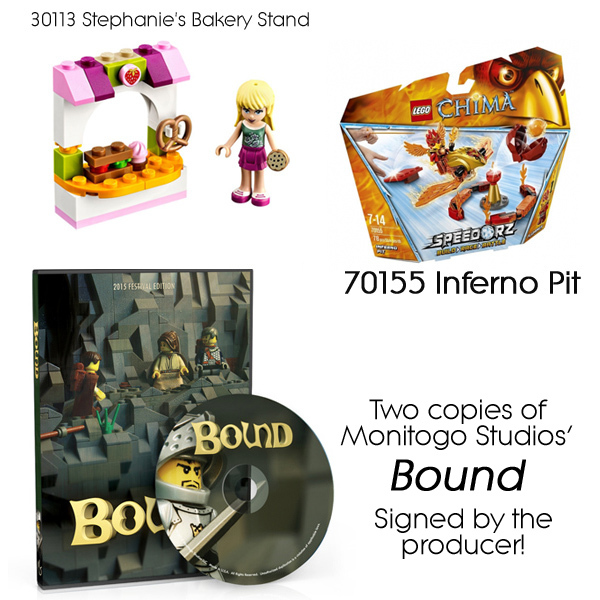 A very special thanks to Monitogo Studios for providing the DVD copies of Bound. Yes, I said copies. The winner will receive 2 signed copies of Bound. (Unless of course, the winner chooses a LEGO set instead). I hope you all are hard at work on your entries! Let's make this a great EASTER contest. Also, don't forget to share with your friends online and in person! The winner will receive 2 signed copies of Bound.